There’s nothing I love more than experimenting with makeup, it’s one of my favourite pastimes. But I will be there first to admit that sometimes there’s nothing better than a quick and easy no-makeup makeup look, especially during summer. A no-makeup makeup look is the perfect option when time is of the essence. Of course, some days it’s nice to wear nothing at all, but makeup is a comfort blanket for many of us that we can use to give ourselves a little confidence boost. Whether you’re looking for something quick and easy for work, or you have a holiday coming up and need the ultimate beach base then we have just the thing! 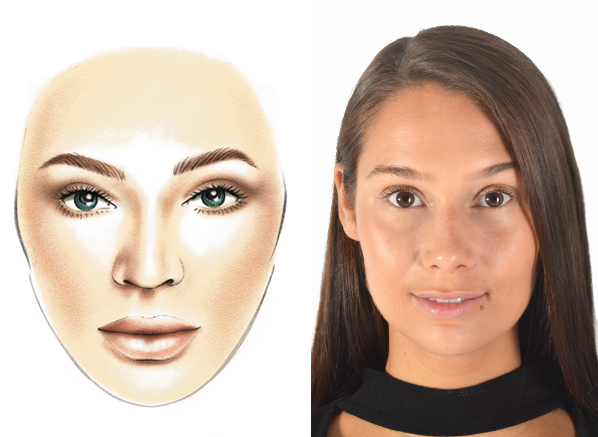 If there’s one step you should never skip in your makeup routine it’s priming. Much to everyone’s shock, priming your skin is actually pretty vital, and will make the world of difference to how your skin looks at the end. For a no-makeup makeup look such as this, a primer will actually enhance the complexion before even applying foundation, which in turn means less foundation and concealer. My primer of choice is the Step 1 Skin Equalizer 3 – Hydrating Primer, a ultra-hydrating moisturising primer for all skin types. As I have just come back from holiday my skin is crying out for moisture, but there’s a plethora of rejuvenating primers available at MAKE UP FOR EVER, so take your pick! Apply primer as the first step in your makeup routine to cleansed, moisturised skin. Apply with the fingertips (or a brush if you prefer) and smooth over skin until fully absorbed. Now it’s time for the main event! A no-makeup makeup look is centred around a good foundation; because if your skin looks healthy and radiant that’s half the battle, right? My go-to for a natural, dewy look is the Water Blend Face & Body Foundation, a light to medium coverage satin-finish foundation that’s causing quite the storm in the beauty world. Water-based and waterproof, I don’t think there’s a foundation quite as summer appropriate as this one! Comfortable and lightweight, Water Blend is a no-brainer for this look as it feels like you’re wearing nothing at all, just pump a few drops onto the Foundation Brush – Large – 108, smooth over skin and voila, a fresh, unified and long-lasting base. A little bit of concealer can make the world of difference. Whether you’re touching up dark circles or any unwelcome blemishes, a few dots of concealer can give an instant confidence boost. My concealer of choice is the Ultra HD Invisible Cover Concealer, a high coverage concealer that has undeniable cult status. The no-nonsense concealer will instantly brighten the under eyes and minimise the appearance of imperfections thanks to its colour correcting, illuminating formula and added hyaluronic spheres, which smooth out fine lines and nourish deep down. 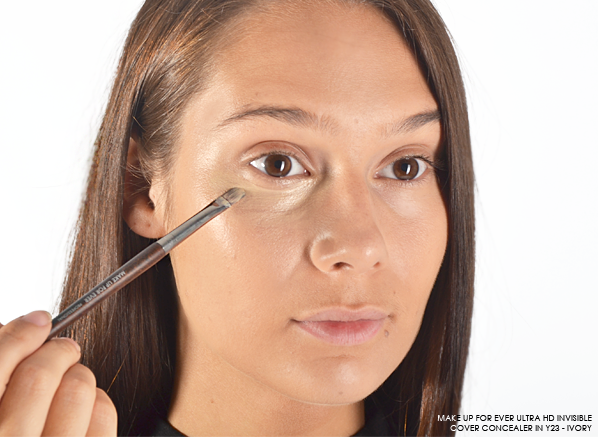 Apply to the under eyes with the Concealer Brush – Small – 174 for a blended and unified result. Apply a small amount to begin (a little goes a long way with this high-coverage formula) and build until your desired coverage is achieved. Do the same over blemishes and any imperfections and set with the MAKE UP FOR EVER Ultra HD Pressed Powder for a long-lasting flawless base. 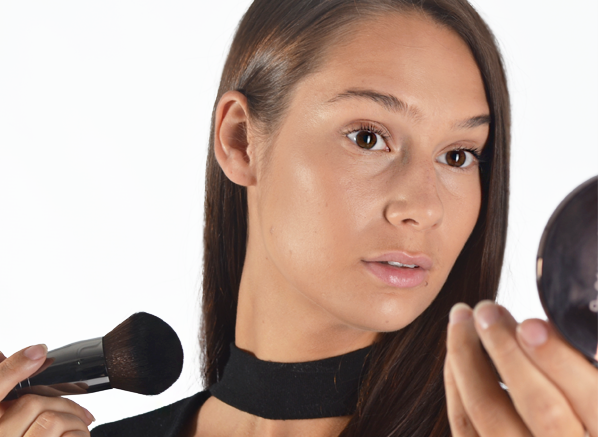 Without a dusting of bronzer on the cheekbones and high points of the face the complexion can look a little dull. So, if a healthy, natural glow is on the agenda this step is a must. A bronzer that I have fallen in love with as of late is the Pro Bronze Fusion, a waterproof, long-lasting formula that looks extremely natural, as if you’ve just stepped off the plane from some exotic land. Available in both matte and iridescent finishes, I like to use the matte finishes to sculpt and etch out my contours and the iridescent finishes to dust along the high points of my face for a glow that catches the light beautifully. And we cannot forget about the brush! 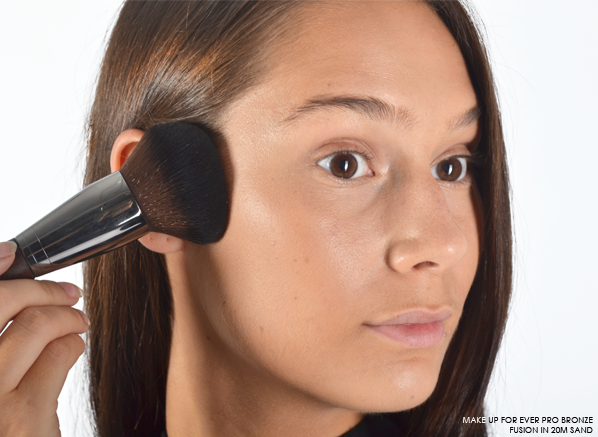 The Powder Brush – Medium – 126 makes applying bronzer a dream as its super soft, synthetic bristles pick up and distribute the perfect amount of product for a natural yet defined result. This entry was posted on Thursday, June 29th, 2017 at 5:37 pm and is filed under Get the Look, Hints & Tips, Make-up, Trends, Tried & Tested. You can follow any responses to this entry through the RSS 2.0 feed. You can skip to the end and leave a response. Pinging is currently not allowed.